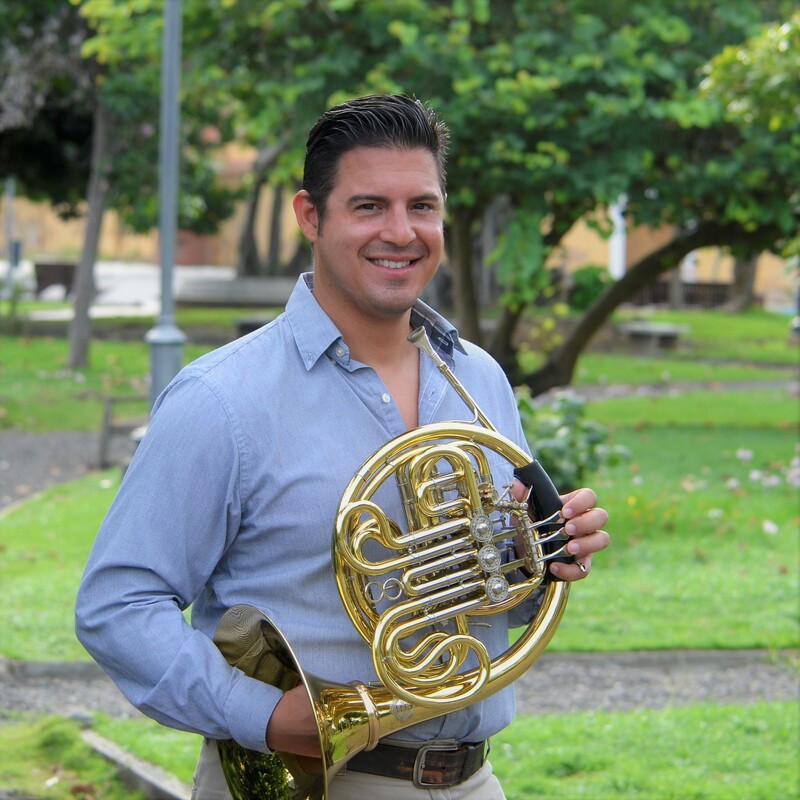 Horn player for the Puerto Rico Symphony Orchestra since 2004, Horn Professor at the Puerto Rico Music Conservatory, College and Pre-College levels. He is an active chamber music performer with Cafe Corta’o Horn Quartet and Camerata Caribe. Joshua is also a composer of romantic and popular songs, lately he is working on Jazz Music, Latin Jazz and improvisation in the French horn. Married to a beautiful Colombian woman, likes to spend his summers in Colombia. Loves coffee, birds and going to the beach! Professor Pantoja began his musical studies at Escuela Libre de Música in Caguas, Puerto Rico at the age of 12. Piano first then he fell in love with the horn. He was accepted into the Puerto Rico Music Conservatory at the age of 15. After a year at the Conservatory he was accepted at Manhattan School of Music in New York where he stays for two years. He continues his musical development at the prestigious Juilliard School where he studied with Professor Jerome Ashby (former Co-Principal Horn of the New York Philharmonic), and obtained his bachelor’s degree on May 2004. He is also a graduate from Manhattan School of Music where he accomplished his master’s degree on Orchestral Performance in 2011 and where he had the opportunity to study with Professor Javier Gándara, 3rd horn of the Metropolitan Opera of New York. His musical career includes The Orchestra of the Americas, where he visited countries in Central and South America, Europe and several states of the United States. Other important musical groups that he has perform with includes Colombia National Symphony Orchestra, Eafit Symphony Orchestra in Medellin, Dominican Republic National Symphony Orchestra, American Russian Young Artist Orchestra (2002 Russia and USA Tour), New York Opera Society, Di Capo Opera in NY, Manhattan Virtuosi, Filarmonica Arturo Somoano in Puerto Rico, Casals Festival, The Juilliard Orchestra, The Juilliard Symphony, Manhattan School of Music Orpheus Institute, Manhattan School of Music Symphony, Philharmonic and Chamber Orchestras, Altenburg Music Festival (Germany), Idlyllwild Music Festival (California), The Orchestra of the Americas (2002,2003,2004,2006), Paquito D’Rivera 50th Anniversary All Stars Concert at Carnegie Hall, VII International Festival of Music and Sacred Art at the Vatican, Rome 2008, World Economic Forum 2010 at Carnegie Hall. He has taught masterclasses at Manhattan School of Music in New York City, at the National University of Colombia in Bogota, at the University of Caldas in Manizales, Colombia, at the University of Eafit in Medellin, Colombia. He has had the opportunity to be a guest Professor at International Horn Festival and Academy in Manizales, Colombia, 2008 and 2009. Joshua has taken lessons with Professors Jerome Ashby, Javier Gandara, Erik Ralske, Julie Landsman, Michelle Baker among others. He has also received improvisation lessons with Jazz Profesor Julito Alvarado. He has shared the stage with great conductors such as Gustavo Dudamel, Valery Gergiev, Placido Domingo, Guillermo Figueroa and many others.